Ok, so admittedly I didn't pick up any of the blasters featured in this article, but I thought it was worth showing people they're out there. None of these interested me, or would really be something I'd play with regularly. Plus the holidays hit my wallet pretty hard and I didn't have the extra cash to pony up for these guys just to do a review. 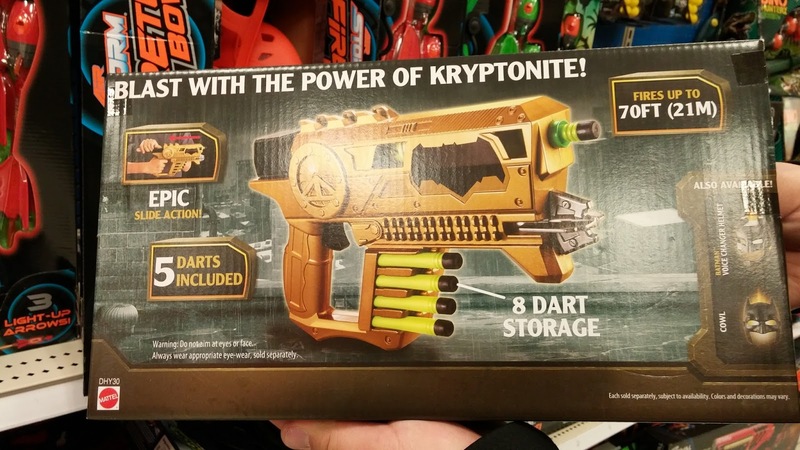 So, this Kryptonite Blaster, it looks nice. Boomco seems to be using their licenses to good effect (take note Hasbro). 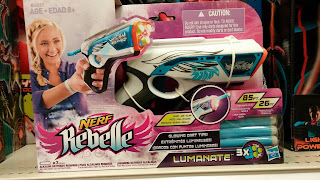 This looks like it's a decent, fun little blaster that jumps in on the movie tie in. 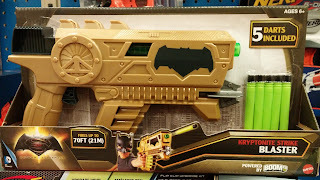 It's not really a game changer by any means, and it's not an interesting redesign of one of their more useful blasters. 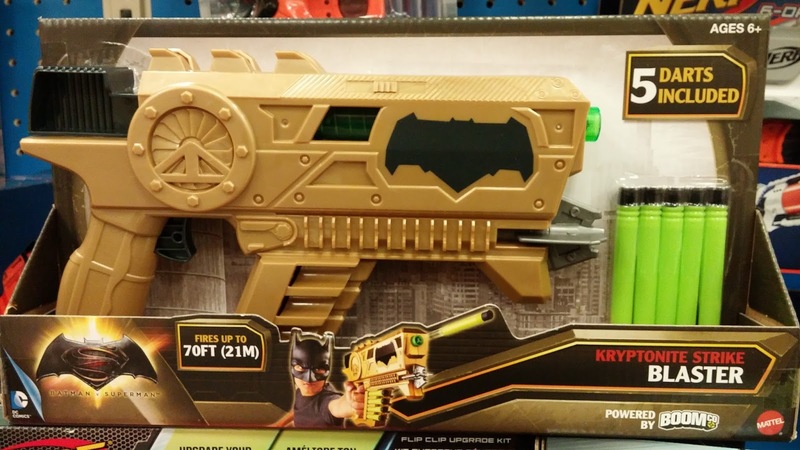 Then again, it's a Batman blaster. Let's face it, it's kinda amazing they were able to pull anything blaster related from that franchise. I couldn't expect too much more. It's not like they have access to IPs that feature lots of blasters or firearms they could make toy replicas of (HINT HINT HASBRO). It was Kimberly who had the bow, and was pink, jeeze! 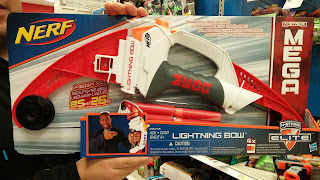 The Lightning Bow is probably my favorite looking of the new blasters I saw. Ultimately, it's a Big Shot with a string and no trigger. Still there was something about the color scheme and the design that I really liked. It reminded me of something that belongs on the set of Power Rangers. The colors are great and the overall design for a bow looks pretty nice. I can't say if it fires better than the Heatbreak though, but using mega darts, let's hope it packs more of a punch. Finally there's the Dual-Strike. It's something that B.F.U. has been thinking about for a while. 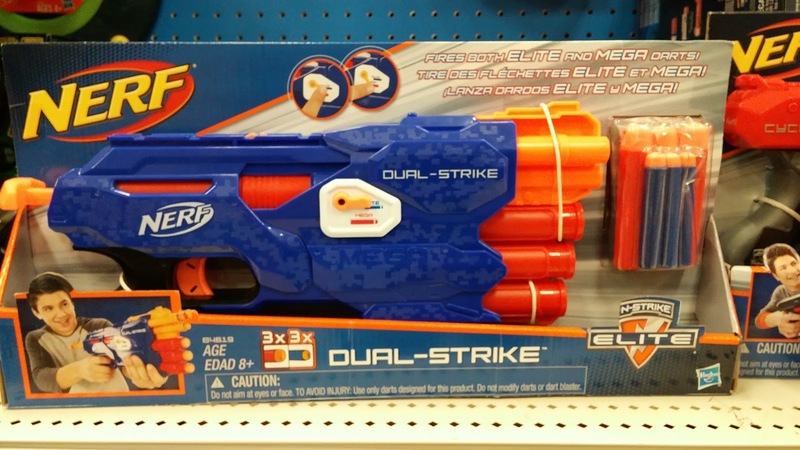 It fires both elites and megas. He was originally thinking of rebarraling every other barrel of a Cycloneshock. This is much more elegant. There's six barrels, three for each type of dart. It utilizes smart AR technology to fire one off at a time. You can use the selector to choose which to engage. It's an elegant little package, and a simple enough blaster. I'm not a fan of the pull back priming mech, but I feel like Nerf is testing the waters here. It's not something I'd personally find very useful (although if you have special rules for megas it could be). If this were more of a primary I could see it getting some use. Still, it's a bit of a niche, but I can see it doing well with the younger crowd, as with most of the other blasters on this list. Looks like that there has been innovation in the designs and all the designs are really eye catching and brilliant. Would really want to purchase one for my nephew. There are a few Nerf weapons accessible in the market today (you can likewise look at Nerf Gun Buyer Guide to Learn More).